1) Activities related to the co-funded call and the consortium management 2) Additional activities. 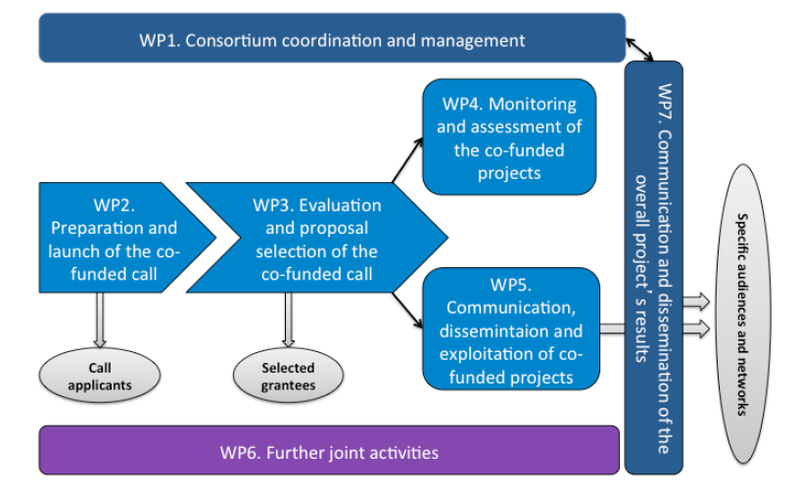 Within the first set of activities, the first work package (WP1) is transverse to the other six WPs as it is dedicated to coordinating and managing the project and its consortium as a whole. This WP will also be devoted to exploring possibilities of extending the partnership and seek opportunities to pursue its work after the project’s end. This WP will run throughout the 60 months foreseen to implement this project. Four WPs were carefully thought through to ensure an effective and efficient implementation of the co-funded call. Preparation and launch of the co-funded call (WP2) and evaluation and selection of projects (WP3) to be funded will run during the first 12 months of GENDER-NET Plus. The selected projects will be funded for three years. Co-funded projects will be closely monitored (WP4). GENDER-NET Plus foresaw a specific WP to communicate about the co-funded joint call and disseminate key messages about the co-funded projects (WP5). Therefore, it will be running since the preparation of the joint call until GENDER-NET Plus concludes its activities. This will ensure that proper visibility is given to the funded projects and their results. As regards the second set of activities, these comprise transnational joint actions of distinct nature (WP6) as well as communication and dissemination activities about the project and its overall results (WP7). These transnational activities will be initiated after having launched the co-funded call and will run until the end of the project. Communication and dissemination activities will run throughout the project’s 60 months.